Couldn't open /users/web/artscare/web/cgi-bin/2019.04.log so I'm bugging out.. 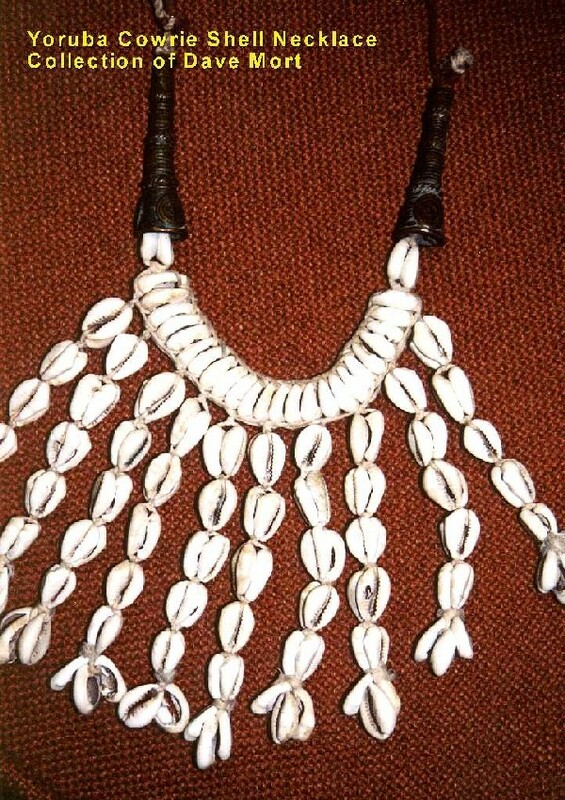 The goal of The Bead Museum Education and Community Outreach Program is to present exhibitions and instruction that facilitate participants' understanding of the symbolic meaning and function of beads in diverse cultural contexts. The exhibition, Yoruba Beadwork: A Web of Significance and Meaning, examines and explores the variety and complexity of Yoruba beaded arts, which have a documented history of nearly one thousand years. The interactive lesson unit Yoruba Beaded Art/Black History: Designs, Repetition, Rhythms and Movement, which accompanies this exhibition, speaks directly to the museum's mission by presenting the visual, musical, performing and literary arts in a collaborative, community celebration. Traditionally, art in early civilizations developed inseparably out of material expression from ritual and ceremonial rites. Many African societies, such as the Yoruba peoples of Nigeria and Benin (Northwestern Africa), function with the beliefs of the respect for the interconnectedness of all living things and in ancestors as spirit guides. A result of these beliefs is that physical acts of communal representation in performance (masquerade), dance, music, storytelling and creative, visual expressions can influence their universe. 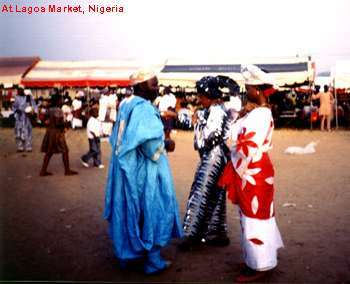 Yoruba-speaking peoples are among the most numerous in Africa with an estimated population of over 25 million. Their enslavement throughout the Americas, Cuba and Caribbean Islands for over three hundred years brought their arts and religion to these countries where they have flourished. 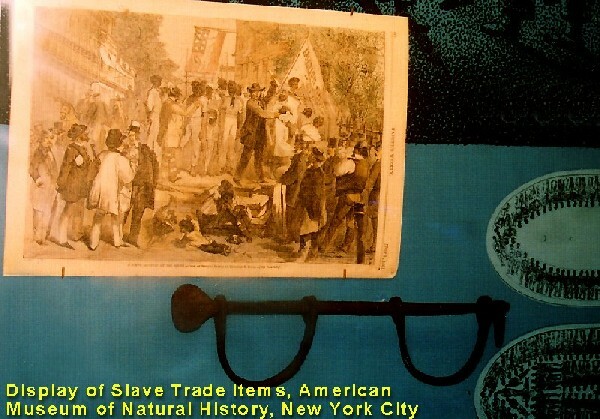 Even though only 4% of those Africans enslaved came to what is now the United States, 40% of these same men, women and children were forcefully uprooted from their Yoruba villages. These persons carried little or nothing with them as personal possessions. 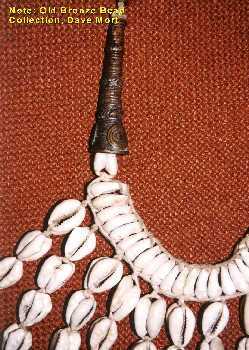 Treasured beads became their one physical symbol of a connection to other people and family left far behind as they crossed the "Middle Passage" (that arduous journey from Africa across the Atlantic to distant lands). The Bead Museum education staff's planning and communication process for this project has relied on strong community partnerships with persons and organizations with similar goals and objectives to design and contribute to the writing of this lesson unit. Music instruction and dance have been included in the curriculum because most African people share music and dance performances as an integral part of their everyday lives. 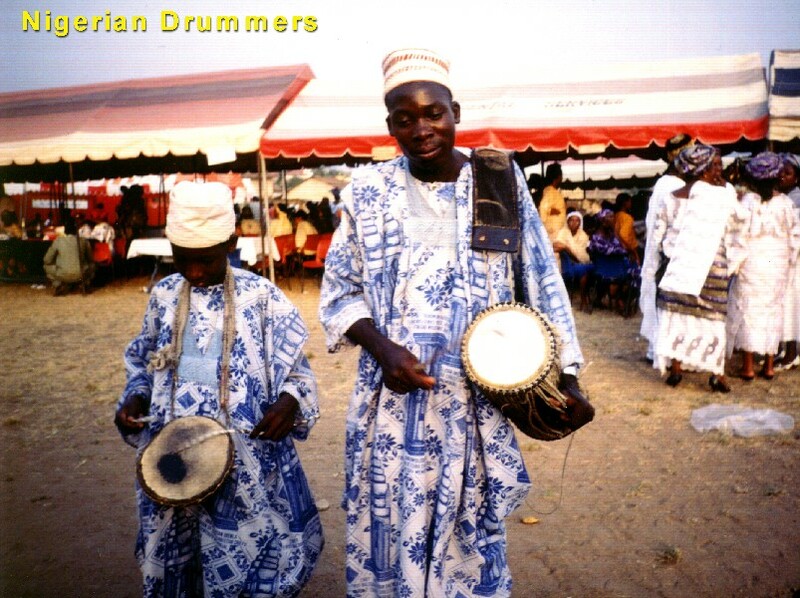 Music and rhythmic movement in Africa must be regarded first of all as a means of communication. Like African language, music and dance can convey meaning about ideas, thoughts, hopes, desires and beliefs. Musical performance in traditional Yoruba societies has a function beyond simple entertainment. One outcome of music and movement, which serves as a social function, helps to strengthen the community because it is a vehicle to communicate with ancestors. African music and dance residencies have been established to provide these additional learning experiences to the participating youth. Primary contributors are noted at the end of this introduction. View art to inquire-demonstrating how the arts reveal universal themes; reflecting upon and assessing the characteristics of their work and the work of others. Yoruba/Black History Lesson Unit (Each lesson will list the goals and objectives of that specific lesson plan.) This is a recommended sequential, developmental process, but can be adjusted to meet the needs of the teachers and the students. The lesson unit is designed for third through fifth graders and is instructed over approximately a two-month block of time. In the team approach it is up to members of the group to develop a time line of instruction and events. Lesson One: Why a Museum About Beads? Why a museum about beads? What is a bead? ** This segment of the lesson unit will be told through the voices of African- American twins (10-12 years of age) who take the students on an imaginary journey to Nigeria in Africa. **The Nigerian cities of Lagos & Ife will be discussed and some of the everyday activities in these two towns presented. **The book by Shel Silverstein, The Giving Tree, will be read as an introduction to the concept of a spirit that is embodied in a tree. **Children will be given information about the concept of the tradition of honoring ancestors and be asked to research their own ancestors. 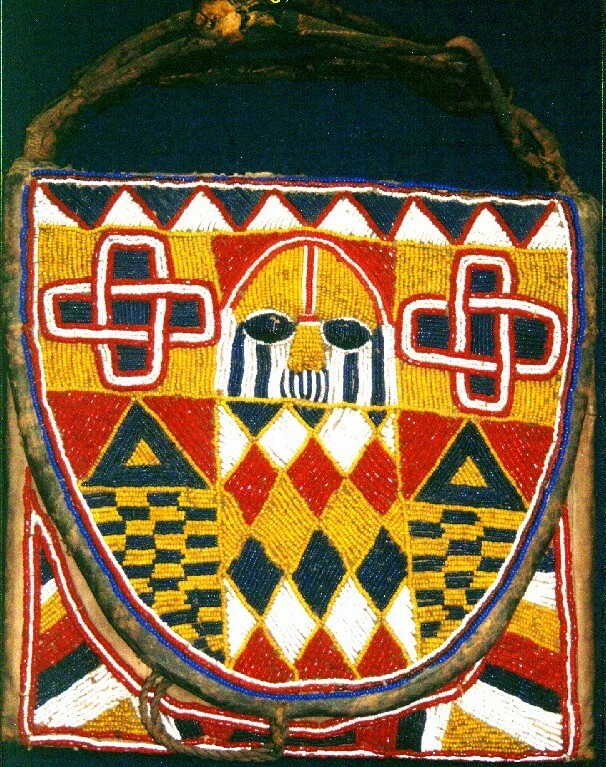 **Information and visuals of Yoruba beadwork will be presented and discussed in more depth. **Discussion will continue about Nigerian artists who still use wood in creating sculptural forms. The term life force will be explained. **Students will be instructed in an art making activity. A visual arts teacher or someone who is familiar with visual arts instruction may interact with the students in presenting this information. This is the ideal situation, but may become the responsibility of the homeroom teacher. Lesson Four: What the USA has gained from those persons enslaved and brought to a New World. This lesson plan focuses slavery in the United States. And it identifies some of the important African- American individuals who have contributed significantly to this country's history. Once again this information is conveyed through the voices of the African- American twins who return from Africa through New York City. They visit Greenwich Village, the Statue of Liberty, Shomberg Center for Research in Black Culture, and Harlem. They also visit the United Nations Building and learn about one of the important founders, Ralph Bunche; the first African-American to be awarded a Nobel Prize. Read the book illustrated and written by Jacob Lawrence, Harriet Tubman and the Promised Land. Follow up with an art making activity. Art activities to accompany this art history lesson: Prisma colored drawings on Black paper. Sweet Honey and the Rock-Choral group-CD Sacred Ground, "We Are"
**Adhering to the Arizona Standard for language arts, each participant is to write at least two paragraphs on what new information they have learned from this lesson unit and the importance of this information to one's life. There will be a community performance and exhibition of the participants' literary and visual arts at the end of the project. Hopefully each participating school will document the total process. Christy Sholola brought the suggestion for this project to the attention of The Bead Museum Staff by expressing her interest in learning more about beads and her desire to convey the history and importance of her husband's culture to their three children. A pilot project was planned a year ago and tested in February, 2004, within the classrooms of two of Ms. Sholola's youth. 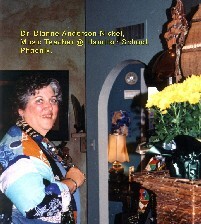 The Bead Museum is indebted to Ms. Sholola for not only her interest and support of The Bead Museum, but her contributions to the writing of this lesson unit and many of the images, providing visual documentation to the story. Christy Puetz, Education Coordinator for The Bead Museum and bead artist extraordinaire worked closely with Christy Sholola designing and facilitating the pilot program. Ms. Puetz's beaded and sculpted forms are not only exhibited locally, but may be viewed in museums and galleries across the country. She also goes into the education communities of the greater Phoenix area as an artist in residence. judy butzine, the Outreach Coordinator at The Bead Museum, has been involved with the museum for six years. 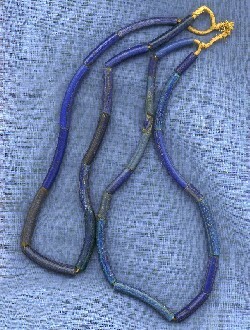 She has found the world of beads one of the most provocative of art mediums to tell stories of cultures around the world. 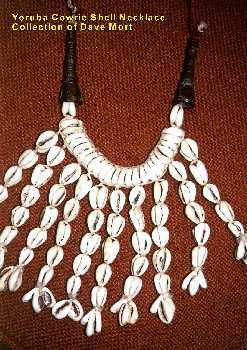 And since ancient cultures did not separate the arts from the whole community experience the musical, performing and storytelling elements of the cultural story can also be conveyed when one speaks about bead history. Dr. Dianne Anderson-Nickel is one of the other very important ingredients in this community collaboration. She is a music instructor at Hamilton School in the inner city of Phoenix (The demographics of the school enrollment is 97% Latino.). By invitation, The Bead Museum education staff, worked with Dr. Anderson-Nickel last fall presenting the Huichol lesson unit. Without Dr. Anderson-Nickel's vision this integrated arts and literacy lesson unit would not be possible. Keith Johnson is not only an amazing musician, but he is a storyteller. His expertise resides in his ability to skillfully instruct students in the use of drums and percussion instruments from cultures around the world; he supplies the magic of costumes and visual backdrops to provide additional ambiance. Mr. Johnson's contributions to the content of the lesson unit are invaluable. Nathaniel Davis has been a bead artist since he was 14 years of age when he repaired a piece of jewelry for one of his aunts. He is a member The Bead Museum Board of Directors and contributes his expertise to the operation of the education/exhibition committee. His input into the content meetings has given all of us a different perspective on the weaving of this educational tapestry. Dr. Eugene Grigsby, Jr. is a state treasure. He came to Phoenix, Arizona, in 1946, to teach at Carver High School (the only Black high school in South Phoenix). The need to support a major African exhibition at the Heard Museum in 1982, gave Dr. Grigsby the opportunity to found COBA (Consortium of Black Organizations and Others for the Arts). 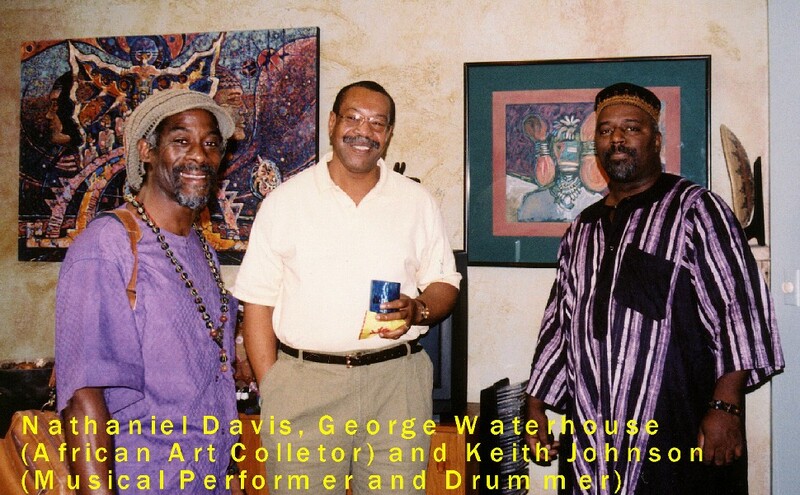 As Professor-Emeritus from Arizona State University in Art Education, Dr. Grigsby is still very vital and active in community events and the world of art. 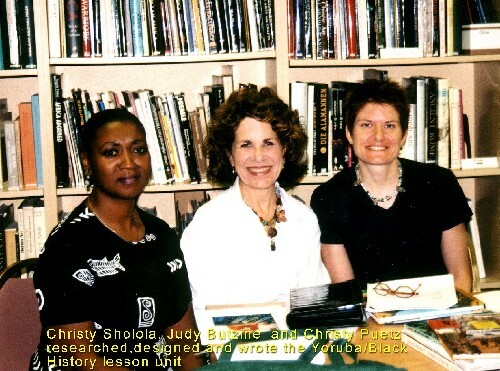 The use of Dr. Grigsby's African and personal art works and his expertise have contributed greatly to the comprehensiveness of this curriculum. George Waterhouse is originally from Honduras. 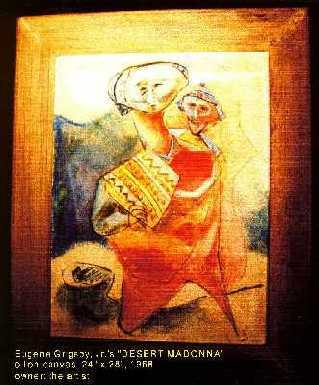 He is a collector of African art objects. His knowledge of these objects' origin and purposefulness has stimulated many a dialogue as the curriculum evolved. Mr. Waterhouse also provided relevant information on Nigeria and Benin due to his travels to these areas. His collection of current research literature written by African experts has clarified some misconceptions about the beaded artifacts being discussed. Dave Mort is a collector of many artifacts from around the world. 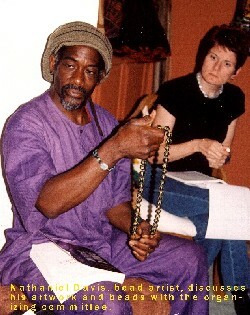 For years Mr. Mort was a member of The Bead Museum Board of Directors. His work and travels in Africa (Democratic Republic of the Congo) as a civil engineer from 1974-1983, provided him with experience most of us only read about. 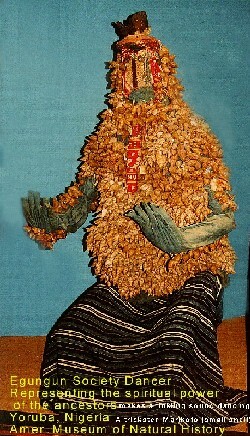 Mr. Mort has most generously donated beads and beaded object to The Bead Museum for many years. 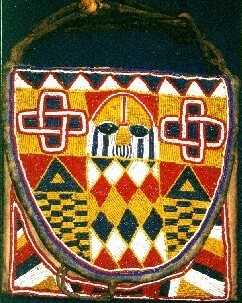 The exhibition, Yoruba Beadwork: Web of Significance and Meaning, would not have been possible without the loan of many of the objects from Mr. Mort's collection. There are others who have been so instrumental in this total community process, including Melanie Ohm, Director of Community Programs in the Herberger College of Fine Arts ASU. Ms. Ohm initiated the first meeting between The Bead Museum staff and Dr. Anderson-Nickel; and she continues to provide guidance to this project.